Wouldn’t it be handy if you could turn your car into a portable power source for your e-cigarette? 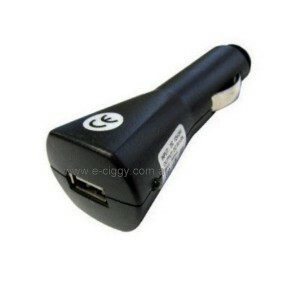 With the Car Cigarette USB you can do just that! The next time you’re cruising down the road and realize your e-cigarette is almost spent of power, all you have to do is plug it in and you’re good to go. This is the ultimate product for the e-cig user on the go. These types of cigs come with a cartridge that contains a liquid known as e-juice, which gives different flavours. However, this does not mean the e-juices are only made of flavours. Other ingredients that make e-juice are water and glycerin, among others. In most cases, ecigs have 5-6 flavours, usually Menthol and Vanilla. When choosing the e-juice flavour that will perfectly match with you, you should seek to know the chemicals that make them. This is because some people are allergic to some chemicals, and they may adversely affect them if consumed. Be sure to choose flavours that are not only the best in quality, but are also fit for your consumption. Currently, there are a lot of e-liquid flavours in existence. This comes along with the great number of e-liquid manufacturing companies that have been established in different countries across the world. It is important to understand that flavours vary depending on manufacturers. There are e-juice companies that only make Menthol and Vanilla flavours, while others are known to produce more than these two flavours. As a matter of fact, there are companies that manufacture up to 19 different flavours. This means that smokers are offered a wide variety of flavours to choose from. The following are some of the popular flavours of e-juices that you can choose from. This is one of e-juice flavours that have been in existence for a long time. In fact, most companies started manufacturing this type of flavour as their first. Menthol comes as a great flavour, which gives a perfect throat hit and a sense of authenticity. When looking for menthol e-juices, it is important to do some research since these flavours may vary from one manufacturer to another. Read reviews and establish the best brand of Menthol e-juice flavours. Some consider tobacco flavour as traditional. However, some people always love going traditional and authentic. If you don’t love trying new flavours for them, then Tobacco flavour will work best for you. The good thing is that there are several Tobacco flavours you can choose from depending on which you prefer most. Fruit flavours are the ideal choice for people who love fruit. Currently, quite a good number of flavours have been manufactured representing particular fruit flavours. Cherry is one of the most popular fruit flavours since it is available in most e-liquids manufacturing companies. Fruit flavours were brought into existence to make smoking reach a higher level and also attract more people.